Buy 1 for $23.81Buy 2 / Save $1.27!Buy 3 / Save $4.76! Herb and fruit tea in some circles is considered a new type of tea. We formulated this blend to accommodate tastes of people who wanted to experience a refreshing healthy new style drink without caffeine. What we got was a terrific "tea" that is unbelievably delicious and enjoyed hot or cold. This tea has a very exotic flavor profile. The delicious blend of fruit and raspberry flavors combined with the natural flavors and tartness of the various dried fruits create a summertime cooler or a wintertime summer reminder. This tea has a flavor that is a melody of fruits. Some of the fruits are exotic and others have a definite North flavor. Think of a Saturday market where the fresh smells of various fruits tantalizingly blend in the air. 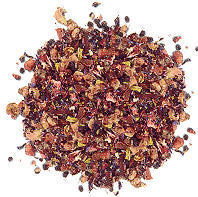 This tea has notes of raspberry that come to the foreground. For a summertime delicacy, drinking Casablanca iced is hard to beat. It is refreshing and thirst quenching and not overly sweet. For formal times garnish the glass with a strawberry and a sprig of mint. For non-formal times pour it into your glass and enjoy it gulp after gulp! If you have small children use the Casablanca tea to make popsicles, they taste great and contain very little sugar. 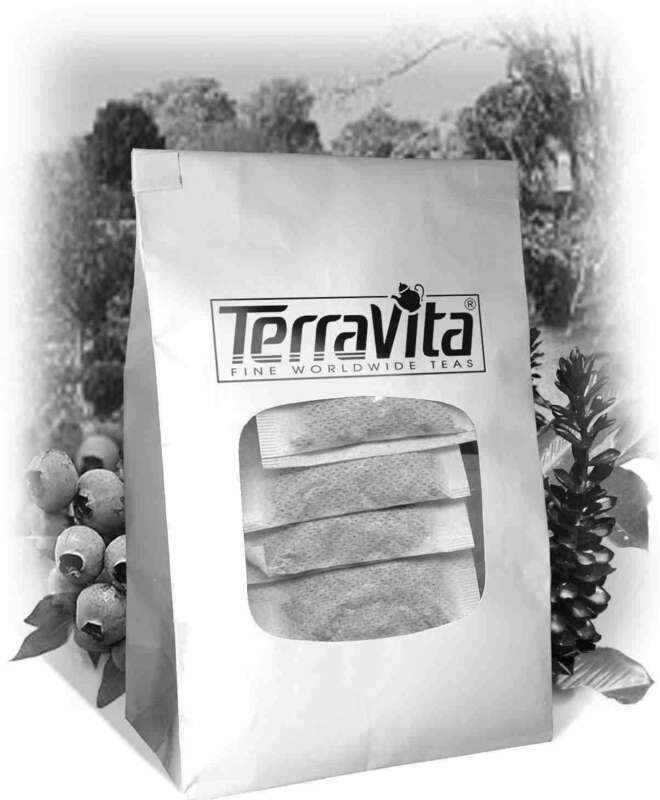 By virtue of the fact that these blends do not contain any tea and are a special blend of fruits and herbs, they are caffeine free. An additional benefit is that these teas contain Vitamin C. What could be better - a healthy drink that tastes GREAT! Hot tea brewing method: Place 1.5 to 2 tea bags of Casablanca per cup (and add 1 tea bag for the pot) into the teapot. Pour boiling water into pot and let it steep for 5-7 minutes (or longer - the longer the steeping time to more intense the flavor becomes). Pour into your cup and add sugar to taste. **do not add milk - the milk will curdle due to the ingredients in this blend. Cold tea brewing method: Do Not Pour Hot Liquid directly into a Glass Pitcher. (makes 1 quart/liter) Put 12-15 tea bags of Casablanca into a heat resistant pitcher. Pour 1 1/4 cups of freshly boiled water over the tea. Steep for 5-7 minutes or longer. Quarter fill a serving pitcher with cold water. Pour the tea into the pitcher straining the bags. Add ice and top-up with cold water. Garnish and sweeten to taste.